Music for Four Voices brought four artists from around the Hudson Valley together on one stage and provided an evening as varied as it was magical. Starting off the evening was Sarah Chesler. Born and raised in Sweden but for the last 10 years a resident of USA, she writes songs in both English and Swedish and performed both on piano and a capella last evening. Sarah is regularly performing and has recently appeared at such venues as: the Towne Crier Cafe in Pawling NY, Caffe Vivaldi, in New York City, and Bistro Du Soleil in South Norwalk CT.
Next on the bill was Newburgh singer/songwriter Todd Guidice. Frank Mathis, host of "Bon Ton Roulet" on WVKR (91.3FM) said of him, "Todd Giudice has a fire and determination in his songs that compel attention. I think his fame time is coming soon, when the world will all catch on to the great stuff he is doing. When it comes to sheer talent and song power, he is definitely there with the "A" league. You can put his songs next to anyone and know he belongs right there with the big names. He was a big hit on my show". Todd performs around the Northeast, having played at such New York City venues as The Living Room, The Knitting Factory and The Bitter End, along with the Colony Cafe in Woodstock and the prestigious Towne Crier Cafe in Pawling where he has opened for Graham Parker and Chris Trapper. Todd has been receiving airplay on area radio stations such as WDST, WKZE, WBAI, WPKN and WVKR, all of which I heartily recommend you add to your regular radio listening regimen. After a brief intermission, Lake Carmel's own Maggie Seligman took the stage. Maggie, producer of last evening's performances, is not a stranger to Arts on the Lake, having performed for us on several occasions over the past couple of years. 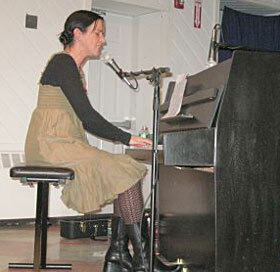 Maggie grew up in NYC and has opened for singer/songwriter Christine Lavin and performed at Pawlingâ€™s Towne Crier CafÃ©. She describes her music as â€œeclectic acoustic;â€ a repertoire that includes traditional, folk, jazz and standard selections. Her CD â€œRubatoâ€ will be released this Spring and a three song sampler was available for sale last evening. As part of Maggie's set she was joined by Todd on slide guitar in which she was able to help her express her lyrical, very interesting and somewhat unique style of music. Closing the evening was Alan Goodman, a critically acclaimed flamenco guitarist who has been performing for over 35 years. Alan's career spans not only the years but musical styles and venues as varied as ABC NO RIO in the East Village to crafting children's albums today. 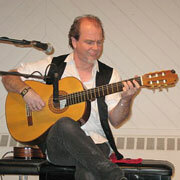 Alan spent a year in Spain leading a jazz trio and studying the history and origins of flamenco music. Alan's last two albums, "Under the Bed" and "Backyard Guitar" have garnered national attention and have won several awards including the Parent's Choice Gold Award. Alan opened his set last night with George Harrison's "Here Comes the Sun" on tenor uke and later in the set was joined by Sarah Chesler on piano for his hauntingly beautiful, "Cancion De La Casa", which is on his album, "Backyard Guitar".